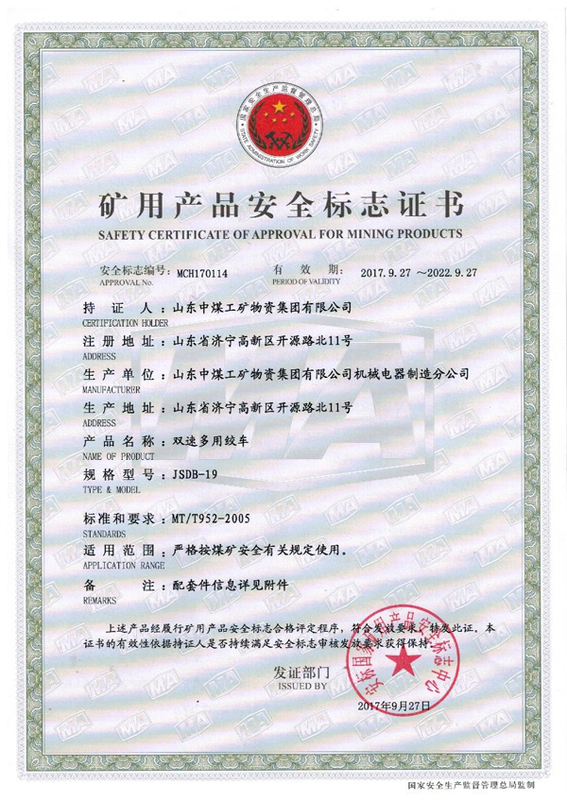 Summary: Recently, a good news came to Shandong China Coal Group, four models (JSDB-10, JSDB-13, JSDB-19, JSDB-25) of Double Speed Multi Function Winch which produced China Coal Group Machinery Company at the same time obtained the national mine product safety signs certificate, this certificate is issued by the National Standard for Mining Products Safety Marks, marking our group produced of winch machine which has been recognized by the state in terms of quality and safety. 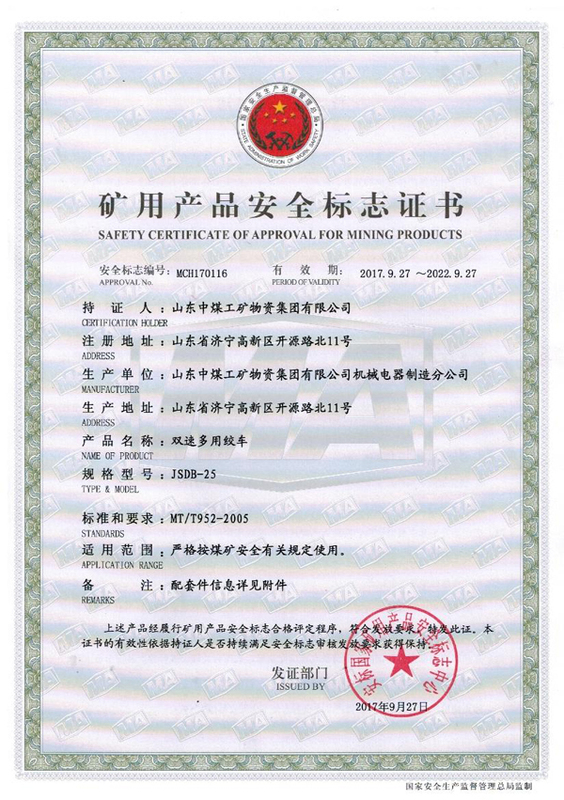 Recently, a good news came to Shandong China Coal Group, four models (JSDB-10, JSDB-13, JSDB-19, JSDB-25) of Double Speed Multi Function Winch which produced China Coal Group Machinery Company at the same time obtained the national mine product safety signs certificate, this certificate is issued by the National Standard for Mining Products Safety Marks, marking our group produced of winch machine which has been recognized by the state in terms of quality and safety. Coal safety certification is the abbreviation of coal mine safety certification. 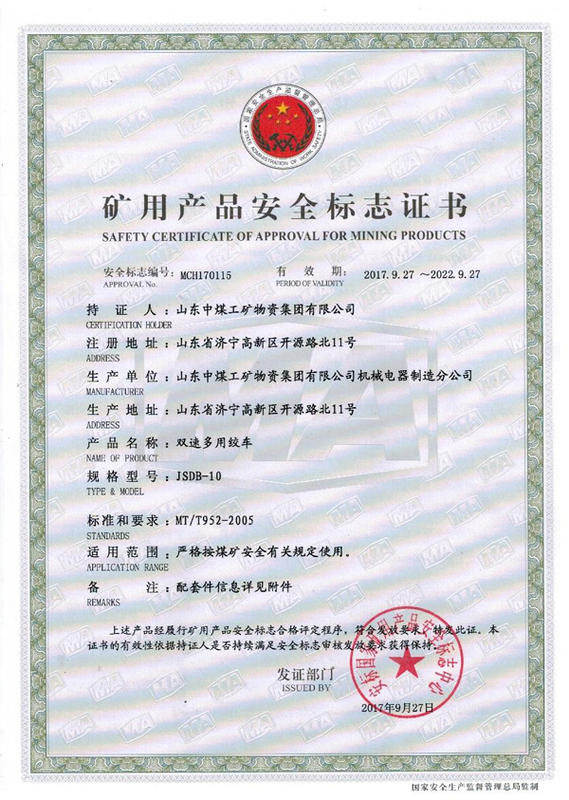 In 2007, the State Economic and Trade Commission and the Coal Mine Safety Supervision Bureau issued the file of "Interim Measures for Safety Signs of Coal Mine and Mineral Products", implement safety certification system to the coal mine equipment, meter,instruments and other facilities, effectively curbed the shoddy products been brought into the underground, so in China's coal mine safety technology system,the certification of mining equipment is an effective way to ensure coal mine safety. 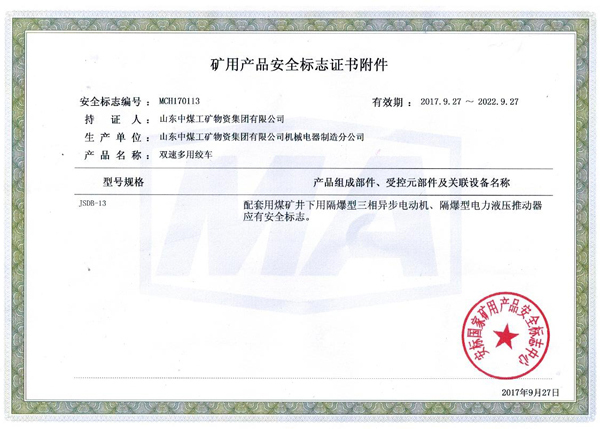 As a national re-credit enterprises, top 10 enterprises of China operating equipment, the outstanding enterprises of China Machinery Industry, the Industry outstanding contribution enterprises of Shandong Province, the innovation and demonstration enterprises of Shandong Province, the "one enterprise and one technology" innovation enterprises in Shandong Province, China Coal Group actively respond to the national safety production requirements, strictly require the product quality, and strive to enhance level of product quality and safety,actively carry out safety certification of mine products, at present,there are more than 80 mining products successfully passed the national mine product safety certification. The next step,our group will uphold the enterprise spirit of responsible for the customers ,community and state.Further pioneering and innovative,to produce more mine products that in line with national standards, with the most secure and highest quality products to return the market and community.